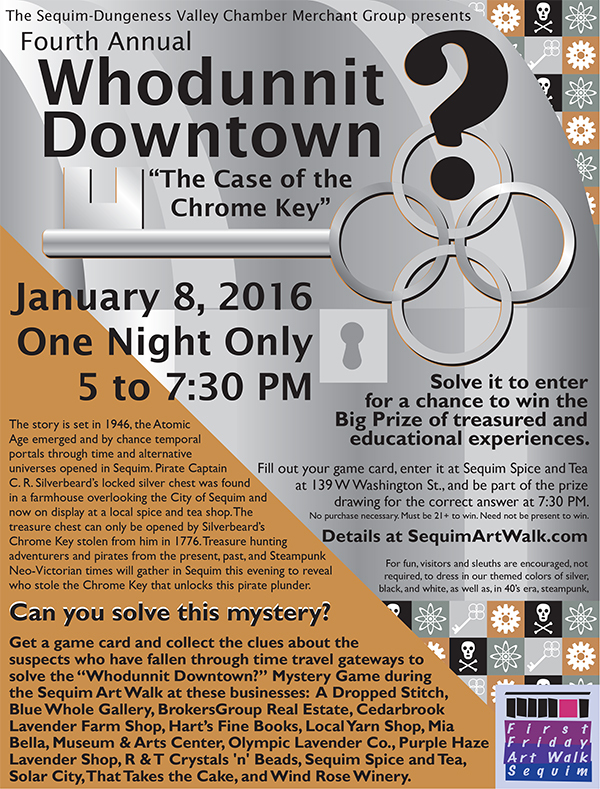 The Sequim-Dungness Valley Chamber Merchant Group presents the Sixth Annual “Whodunnit Downtown? 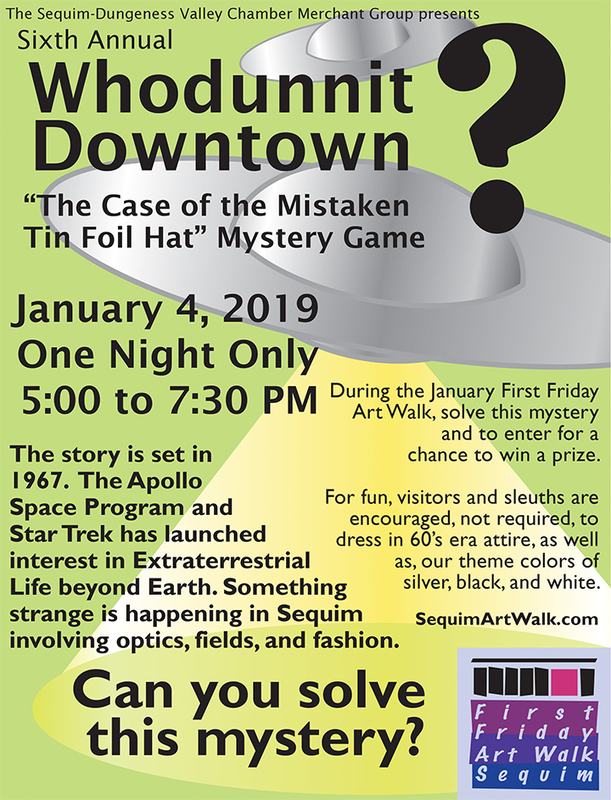 – The Case of the Mistaken Tin Foil Hat” Mystery Game which is a fun-filled evening where visitors engage with suspects and collect the clues about them at various venues to solve the crime for a chance to win a prize during the January 4, 2019 First Friday Art Walk Sequim from 5:00 to 7:30 PM. Our story is set in 1967. The Apollo Space Program and Star Trek has launched interest in Extraterrestrial Life beyond Earth. This galactic curiosity apparently inspired the famous fashion designer, Specular Specular, who launched her haute couture spring line with glowing reviews and petty theft. Amok camera flashbulbs blasts during the fashion show finale, her silver showstopper topper, the 50’s inspired satellite dish tin foil hat, was stolen right off the model! Flashing lights, futuristic ideals, and unfamiliar faces have descended and something strange is happening in Sequim involving optics, fields, and fashion! Can you solve the mystery? 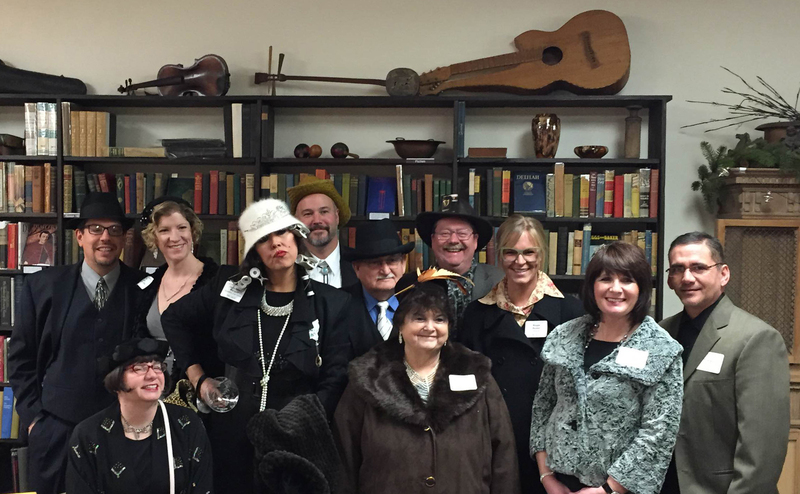 Find the clues about the suspects at the “Whodunnit Downtown? – The Case of the Mistaken Tin Foil Hat” locations during the First Friday Art Walk Sequim. Go boldly as you adventure around the Sequim Art Walk venues to mingle with the suspects in our mystery game and discover why they might have stolen Specular Specular’s “Tin Foil Hat” starting at 5 PM. You can solve this crime that will inspire communication and inclusion by finding clues at these local businesses: Bag Ladies of Sequim at 161 W Washington St., Blue Whole Gallery at 129 W Washington St., Cedarbrook Lavender at 134 1/2 W Washington St., City of Sequim Civic Center at 152 W Cedar St., Evil Roy’s Elixirs Distillery 209 S Sequim Ave., Forage Gifts & Northwest Treasures at 121 W Washington St., Peninsula Taproom 210 W. Washington St., Rainshadow Café at 157 W Cedar St., Sequim Habitat Boutique Store at 213 E Washington St., Sequim Spice and Tea at 139 W Washington St., Sunshine Café at 145 W Washington St., That Takes the Cake at 171 W Washington St., and Wind Rose Cellars at 143 W Washington St.
Can you solve this mystery? Pick up your game card at any of the participating venues at 5:00 PM. Fill out your game card, enter it at Sunshine Café at 145 W Washington St., and be part of the prize drawing for the correct answer at 7:30 PM. No purchase necessary. Must be 21+ to win. Need not be present to win. Winner drawn by random and prizes donated by local businesses. The first game card drawn with the correct answer wins the big prize of gifts from Sequim friends and businesses including a stay at the Seaview Vacation Rental at Cedarbrook Lavender and Herb Farm. 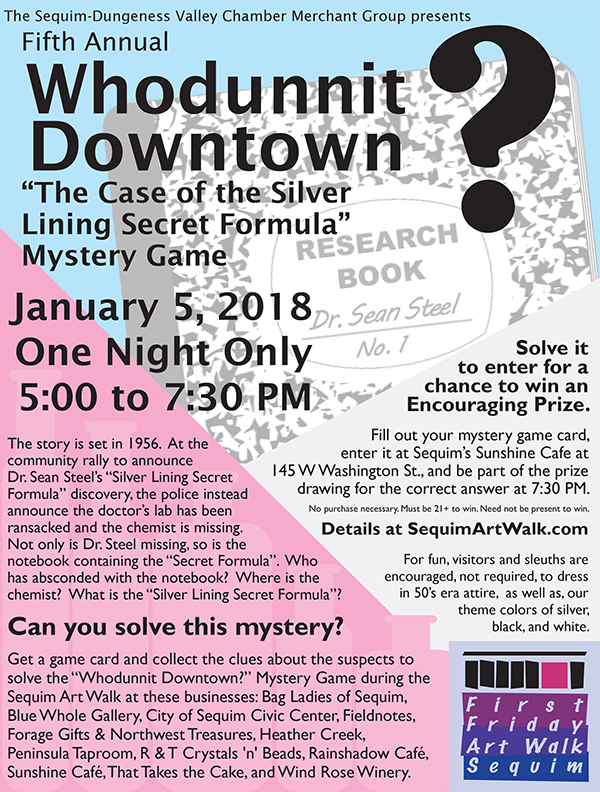 Visitors and sleuths to the “Whodunnit Downtown?” and Sequim Art Walk are encouraged to dress in our themed colors of silver, black, and white, as well as, in 60’s era attire and Star Trek motivated costumes. It is not required, but dressing up makes the evening more fun and festive. 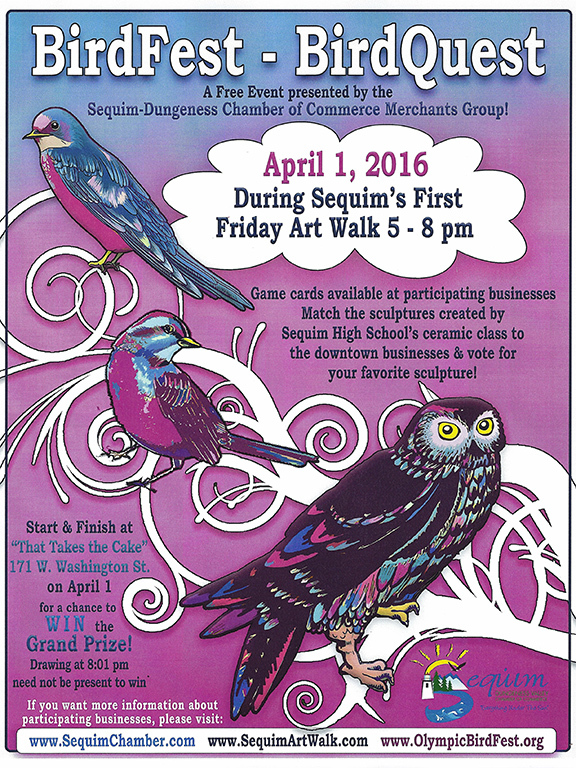 Special Events during the First Friday Art Walk Sequim! Upcoming Special Events for 2019! 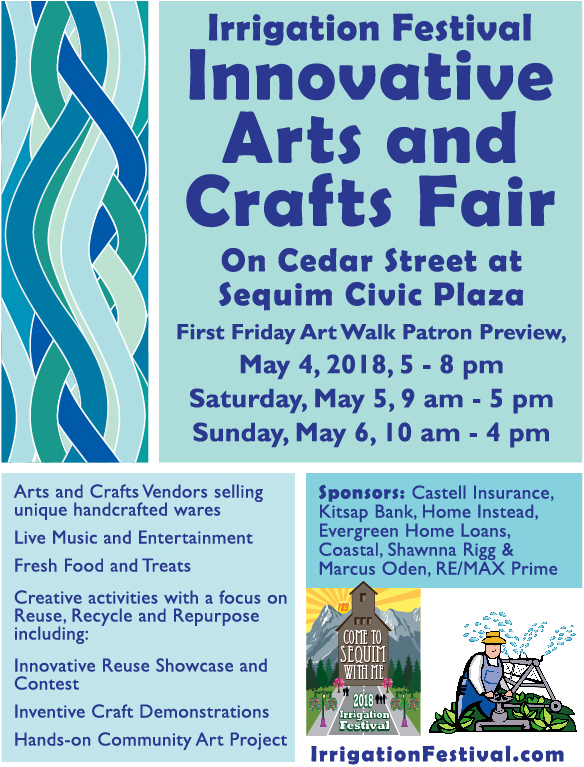 The 123rd Sequim Irrigation Festival Innovative Arts and Crafts Fair is on May 5 and 6, 2018 with the May 4 First Friday Art Walk Sequim Patron Preview. Our Innovative Arts and Crafts Fair emphasizes reusability, repurpose and recycling. This creative community event provides an opportunity for vendors to sell their unique handcrafted wares and for folks to have active engagement with the artists. We invite the public to enter creative works or vote for awards during our Innovative Reuse Showcase and Contest. 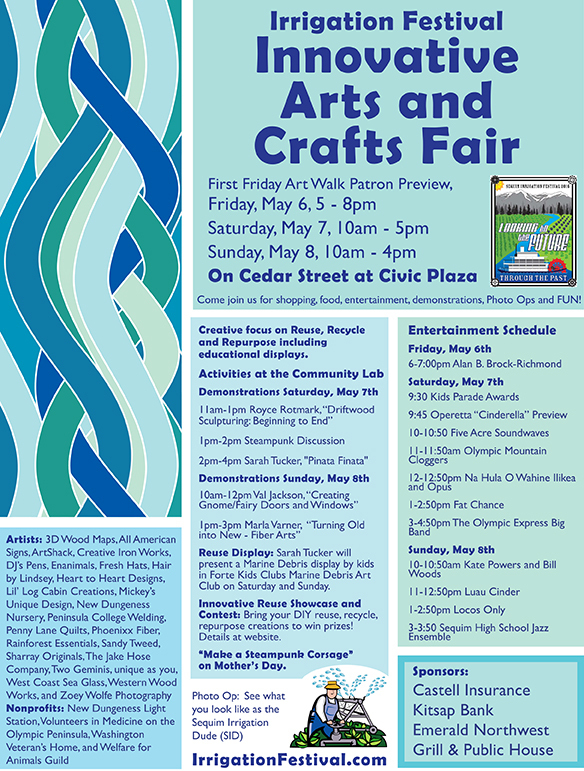 Also with the arts and crafts vendors, enjoy a selection from our food vendors, our amazing main stage entertainment, clever demonstrations of sustainable arts and crafts, and an opportunity to participate in our hands-on community art project. Come join us for shopping, food, photo ops, entertainment, demonstrations, and FUN at Cedar Street at Sequim Civic Plaza. Vendors include 3D Wood Maps, Aloha Smoothies, Apple Cox, Art to Suit You, Cherokee Beach Creations, Creative Iron Works, LLC, Debbie’s Fun & Affordable Jewelry, DJ’s Pens, Enanimals, Fairview Lake Studios, Fresh Hats – Love on Your Head, Friday Harbor House of Jerky, Happy Cells Studio, hue are you?, If Found Treasurers, Lil’ Log Cabin Creations, Lisa’s Designs, Mickey’s Unique Designs, Moments in Time and Design, Inc, Mystery Bay Coastal Cuisine, New Dungeness Light Station Association, New Dungeness Nursery, Olympic Peninsula Authors, OPT Signs, Paperwings Studio, Phoenixx Fibers, Rock and Gem Liaisons, Sharray Originals, The Chart Artist, The Jake Hose Company, The Shepherd’s Fold, Transister Sister, Sassy Glass, Sequim Bee Farm, Sequim High School Class of 2019, Sequim Valley Products, Snow Creek Leather, Straus Bavarian Nuts, Uniquely Designed Jewelry, Vicki Wickell Watercolors, Volunteers in Medicine of the Olympics, Warpath Woodworks, Welfare for Animals Guild (WAG), and Whidbey Island Fudge Company. Innovative Reuse Showcase and Contest: Bring your DIY reuse, recycle, repurpose creations to win prizes! Enter to win in the People’s Choice Awards in our 4 categories: Wearable, Functional, Decorative, and Kids 15 and under. Details at the IrrigationFestival.com website and contact Kelly at 360-461-3950 or JustAskKelly@olypen.com Please deliver your creations on May 4, Friday evening or May 5, Saturday morning. 10am – 4 pm Color small pieces of the 2018 Irrigation Festival logo to make a giant logo mural that will be on display at Coastal. 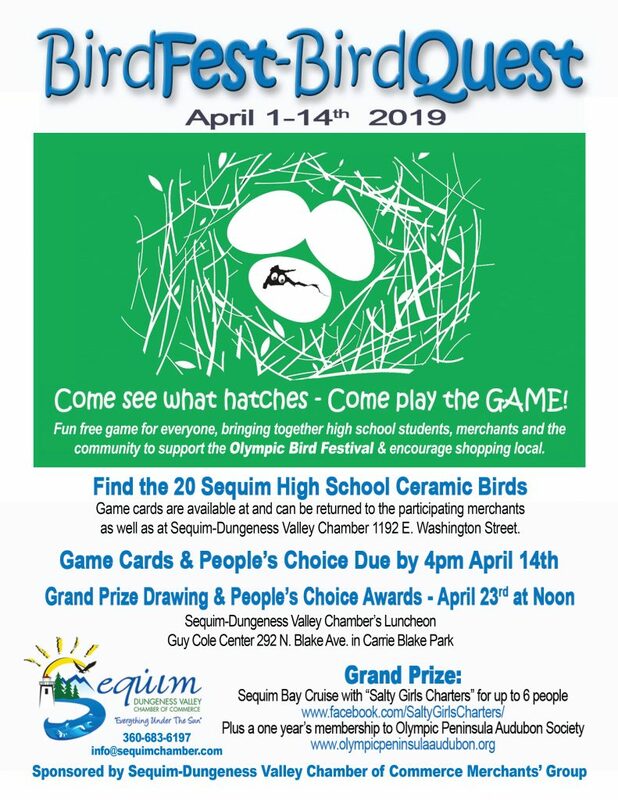 Play BirdFest-BirdQuest by finding the birds created by Jake Reichner’s Sequim High School ceramics class, in Sequim’s downtown businesses, during First Friday Art Walk 5:00-8:00 PM. Pink is April’s First Friday Art Walk theme color, so wearing pink is encouraged. 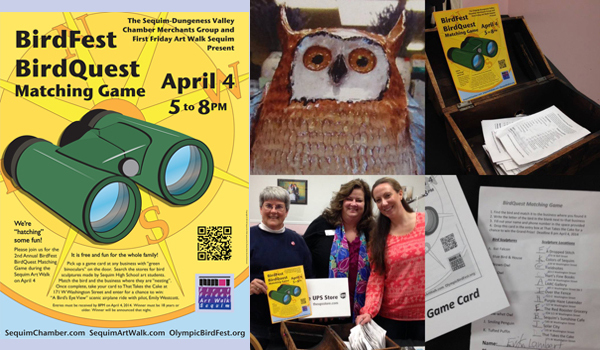 At 8:00 PM the Grand Prize drawing of the correct BirdFest-BirdQuest game card and the announcement of the top three vote-getters for People’s Choice awards will take place at That Takes the Cake. You need not be present to win. Then the students’ sculptures will be on display at BirdFest Central inside the Dungeness River Audubon Center until the afternoon of April 17th. 1. Blue Hole Gallery, at 129 W. Washington St.
2. Cedarbrook Lavender, at 134 1/2 Washington St.
3. Fieldnotes, at 123 Washington St.
4. Fudd’s Fish & Chips, at 173 W. Washington St.
5. Hart’s Fine Books, at 161 W. Washington St.
6. Heather Creek, at 122 W. Washington St.
7. Olympic Lavender, at 120 W. Washington St.
8. Purple Haze Lavender, at 127 W. Washington St.
9. Rusting Rooster, at 154 E. Washington St.
10. Solar City Boutique +, at 135 W. Washington St.
11. That Takes The Cake, at 171 W. Washington St.
12. Wind Rose Cellars, at 143 W. Washington St.
Come marvel at the display of the Olympic Peninsula Art Association’s Student Show art pieces. These are the ones who received awards from Olympic Peninsula Audubon Society for “BIRD ART” and from the Dungeness River Audubon Center for “CONNECTIONS WITH NATURE”. The Sequim-Dungness Valley Chamber Merchant Group and First Friday Art Walk Sequim presents the Fourth Annual “Whodunnit Downtown? 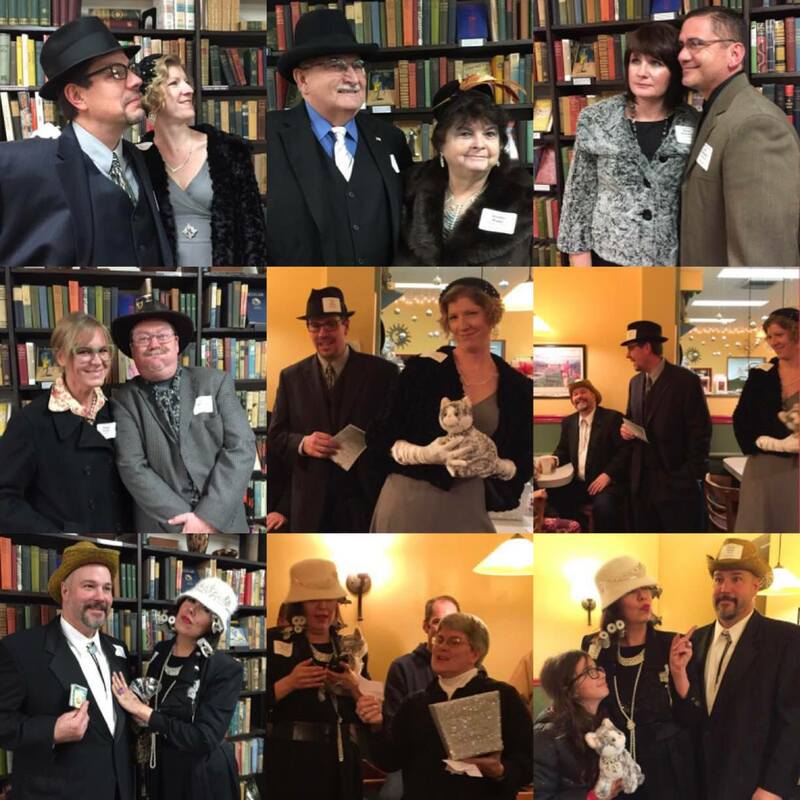 – The Case of the Chrome Key” Mystery Game for a fun-filled evening as we step back in time into the 1940’s to collect the clues about the suspects who have fallen through time travel gateways and solve the crime to win a big prize. The story is set in 1946, the Atomic Age emerged and by chance temporal portals through time and alternative universes opened in Sequim. Pirate Captain C. R. Silverbeard’s locked silver chest was found in a farmhouse overlooking the City of Sequim and Strait of Juan De Fuca. The chest from the past became a shiny curio on display at a local spice and tea shop. The treasure chest can only be opened by Silverbeard’s Chrome Key stolen from him in 1776. 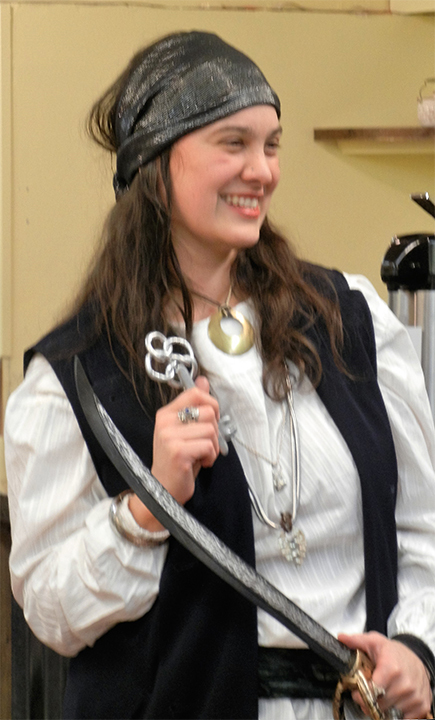 Treasure hunting adventurers and pirates from the present, past, and Neo-Victorian times will gather in Sequim this January 8th evening to reveal who stole the Chrome Key that unlocks this pirate plunder. Adventure around the Art Walk venues to mingle with the suspects in our mystery game and discover why they might have Captain C. R. Silverbeard’s Chrome Key starting at 5 PM. 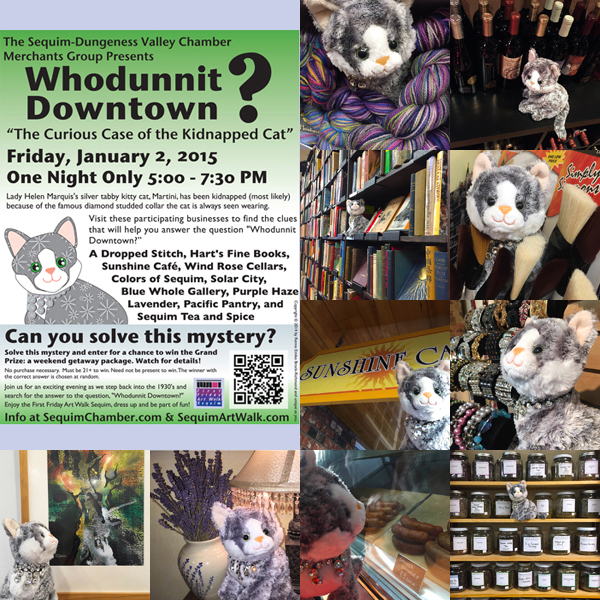 You can solve this crime that crosses time and space by finding clues at these local businesses: A Dropped Stitch at 136 S 2nd Ave., Blue Whole Gallery at 129 W Washington St., BrokersGroup Real Estate at 219 W Washington St., Cedarbrook Lavender Farm Shop at 134 1/2 W Washington St., Hart’s Fine Books 161 W Washington St., Local Yarn Shop at 213 E Washington St., Mia Bella at 130A N 3rd Ave., Museum & Arts Center at 175 W Cedar St., Olympic Lavender Co. at 120 W Washington St., Purple Haze Lavender Shop at 127 W Washington St., R & T Crystals ‘n’ Beads at 158 E Bell St., Sequim Spice and Tea 139 W Washington St., Solar City at 135 W Washington St., That Takes the Cake at 171 W Washington St., and Wind Rose Winery at 143 W Washington St.
Can you solve this mystery? Fill out your game card, enter it at Sequim Spice and Tea at 139 W Washington St., and be part of the prize drawing for the correct answer at 7:30 PM. No purchase necessary. Must be 21+ to win. Need not be present to win. Winner drawn by random and prizes donated by local Sequim Businesses. The first game card drawn with the correct answer wins the big prize of treasured and educational experiences including a Two Night Stay at the Seaview Vacation Rental from Cedarbrook Lavender and Herb Farm, One Cake Decorating Class from That Takes The Cake, A Knitting Class from A Dropped Stitch, Two tickets + T-Shirts to Purple Haze Daze from Purple Haze Lavender Farm, 30 Minute One-On-One Class with MacTraders, “Sequim~Dungeness Valley” by Katherine Vollenweider from the Museum & Arts Center, sea glass earrings of historic cobalt blue in sterling silver from West Coast Sea Glass, and more! 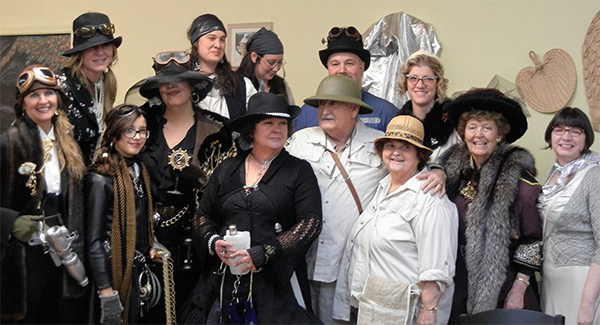 Visitors and sleuths to the “Whodunnit Downtown?” and Sequim Art Walk are encouraged to dress in our themed colors of silver, black, and white, as well as, in 40’s era, steampunk, or in pirate garb. It is not required, but dressing up makes the evening more fun and festive. 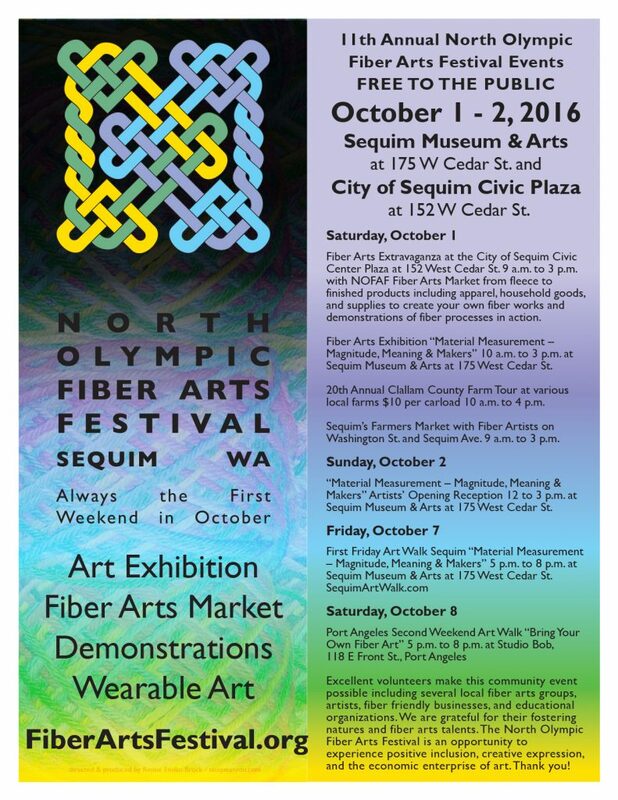 Tenth Annual North Olympic Fiber Arts Festival in Sequim WA is October 2, 3 & 4, 2015. Join us for this interactive fiber arts event connecting to the community with activities like a museum exhibition, workshops, educational demonstrations of fiber processes, hands-on projects with children and adults, Fiber Arts Market of local artists work and fiber supplies, lecture, and information about local fiber activities, groups, businesses, and instructional resources. 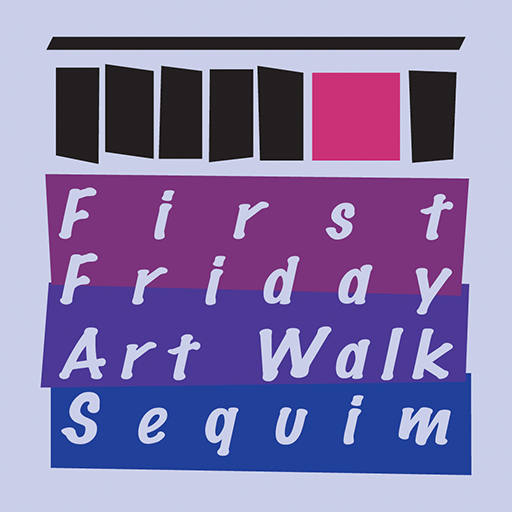 Join us for a fun and free self-guided tour of local art venues in Sequim on the First Friday of every month from 5 – 8 p.m.
Our mission is to create approachable and accessible art and cultural venues that encourage the community to connect and celebrate expression and diversity. 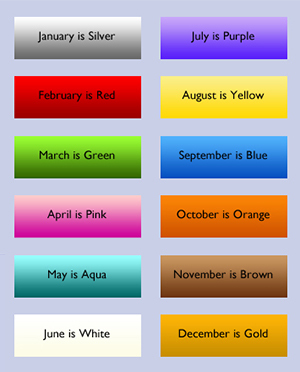 To create inclusion during the Art Walk, every month has a color theme. This encouraging and educational arts event is produced by Renne Emiko Brock.